The bedroom is the biggest room of the house. It's made of stone according to traditional architecture and it is a dome (white stone arch) with a skylight to allow natural light to enter the room. The living room was the winepress in the original use of the house. In its original arrangement the room contained a "lano" (winepress) which was defined by a dwarf wall of about 1 meter at the right side of the room. In the center of the room you can still see the "poulani". The room in made of stone. The kitchen is the most recent addition to the house. 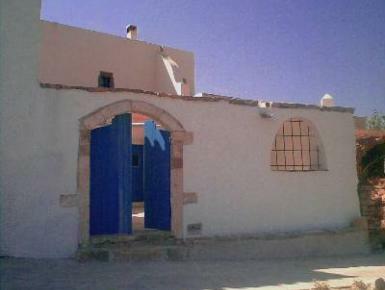 It was built approximately 10 years ago and has a wooden roof with tiles. The kitchen is fully equipped with kitchenware and appliances.